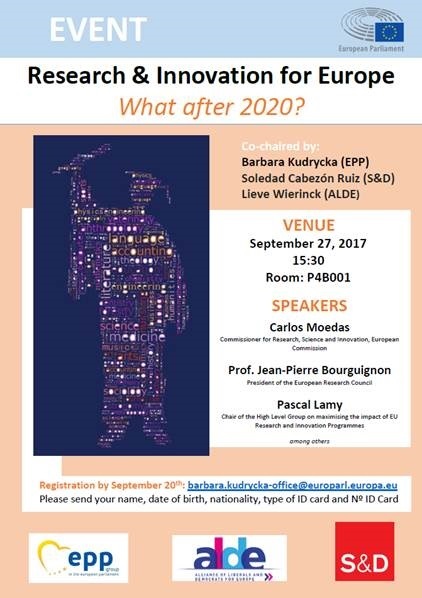 Research & Innovation for Europe: What after 2020? EBC representatives attended the event “Research & Innovation in Europe” organized in the European Parliament on 27 September. The discussion primarily revolved around the future FP9 research scheme as well as its potential impact on the European economy. Furthermore, the speakers of the three panels presented on topics such as public return on R&I public investments, excellence in research and the balance between research and innovation in the post-2020 EU research programme. The conference was introduced by Pascal Lamy, Chair of the High level Group on Maximizing the Impact of EU Research and Innovation Programmes. The report LAB – FAB – APP: Investing in the European future we want, which lists the aim to enhance and understand the brain by 2030 as a potential mission for the next EU framework programme, was recently released by the High Level Group. Robert-Jan Smits, Director General for Research and Innovation at the European Commission, shared his concerns about the proposed cut of €500 million to next year’s Horizon 2020 budget. The proposal to lower the budget of the research programme was recently rejected by the budget committee of the European Parliament. Director General Smits also highlighted the importance of bringing science closer to citizens and stated that Europeans need to see the benefits of science to society. The event was hosted by Soledad Cabezón Ruiz (S&D), Barbara Kudrycka (EPP) and Lieve Wiernick (ALDE).